Reduce clutter in your garage or basement, and keep those expensive clubs organized and off the floor when not in use. This incredibly sturdy storage rack easily installs on any wall, and includes enough hooks to hang six bags of varying shapes and sizes. Neatly arrange the whole family's golf bags in one convenient location, and always have them easily accessible when it's time to hit the green. They will be protected from moisture and dirt on the floor, and it will eliminate the possibility of expensive equipment getting buried, or otherwise damaged. Installation is quick and easy, and the strong materials ensure that this incredible rack will last much longer than the golf equipment it will be holding. Multiple hooks in two different styles will make it easy to adapt to your specific equipment, and all hardware necessary for installation is included. It even comes complete with a lifetime warranty from the manufacturer. The Golf Bag Rack by Monkey Bars Storage offers one of the best ways to store the whole family's clubs in one compact and convenient location. It will allow you to free up trunk space, reduce garage clutter, and ensure that your golf bag remains clean and undamaged when you are not using it. It is incredibly easy to install, and should only take about fifteen minutes from start to finish. It does need to be secured to a stud or other sturdy material, so in most cases, a stud finder will make the job easy as you search for a stud in the location you want the rack. Once found, take one of the brackets to mark where the holes are, and then set it down to drill pilot holes where you just marked. From there, you will then determine where the other bracket should go, and then repeat the previous steps to prepare for mounting. Use the included screws to mount the two brackets to the wall, and then insert the main bar and check for level. The bar will slip right into place once you depress the little button, and once through the hole, the little tab will pop back up to secure it in place. You now have a sturdy bar on your wall from which you can attach the included hooks. These hooks will pop right on, and then slide along the length of the bar to remain in any spot you desire. To hang a bag for storage, simply lift up and attach to a hook. 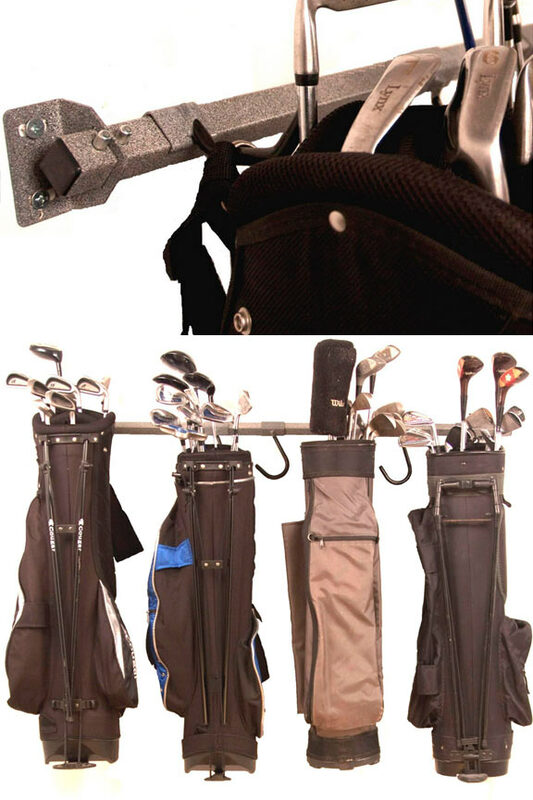 Due to the design, this rack can accommodate any style of bag, and it is large enough to handle six full size bags of clubs. Despite the top end capacity, the bar is not so large that it will look silly with only two up there, but you will always have the room for expansion, or the ability to hang complimentary equipment. Proper storage will ensure proper function, and also make your clubs last longer. When tossed on the floor of your garage, or leaned against a wall, you run the risk of moisture damage coming from the floor, or accidental damage caused by other items in your garage. The kids can step on them looking for their toys, and the bag is pretty much guaranteed to collect dirt, grease and who knows what other grime that might be in there. Hanging and elevating your bags will eliminate all contact with other objects or surfaces, and keep them neatly organized in a more compact space. For this reason, the rack will not only protect your clubs, it will also make your garage or shed more usable because it will help to free up space. Because it will not self destruct if other items are hung up there, you can even increase usefulness, or make use of unused area by storing other sports equipment, or complimentary golfing supplies. Stop driving around town with a bag of clubs in your trunk, and don't spend another day treating your expensive clubs like any other yard tool or extension cord in your garage. Get this incredibly durable rack to store and secure them in a manner that reflects their expensiveness and importance. Order Yours Today! 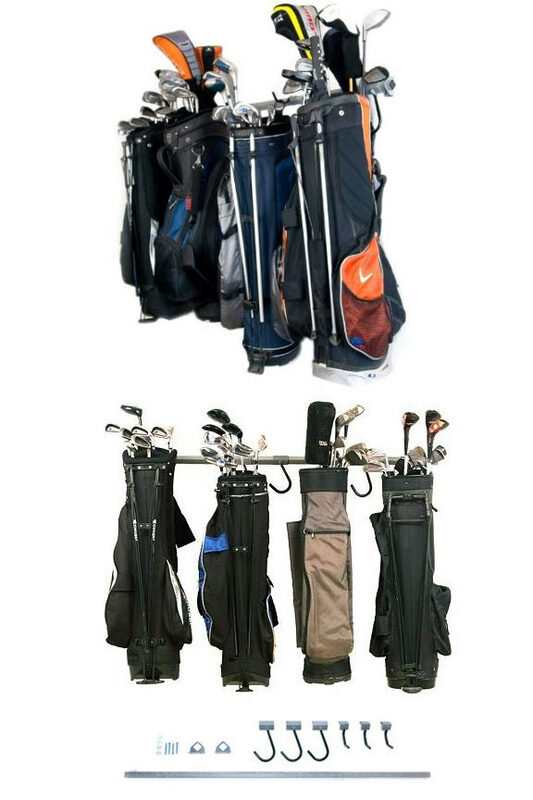 Uses Keep golf equipment neatly organized when not in use. Hold up to six bags of clubs in order to keep them out of your trunk, and off of the garage floor. Compatibility Hang up to 6 bags. Works with any kind of bag. Capacity Hang up to 120 lbs. Hooks Included Comes with three "j" hooks, and three 3" single hooks. 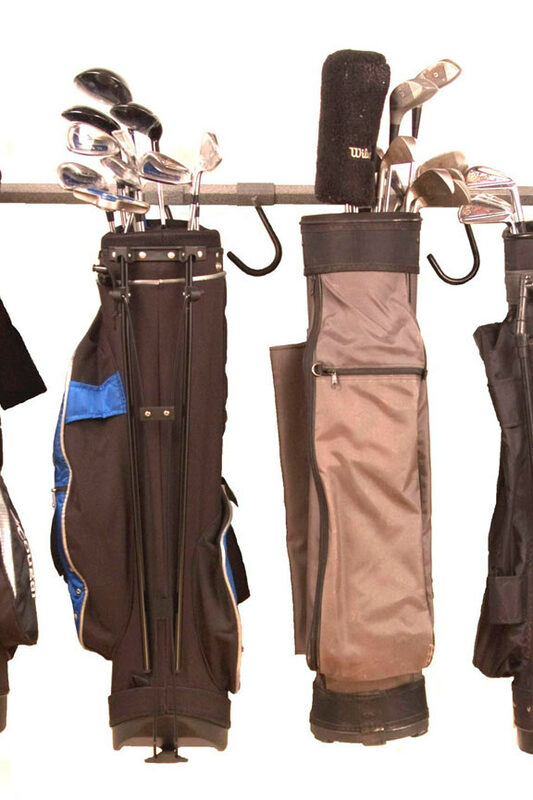 Golf Bag Storage Rack - One of the best ways to preserve your clubs, prevent damage, and keep them organized. Hang your golf bag off the ground to give it a home, but also prevent damage, reduce clutter and keep it clean. Order Yours Today!